The entrance to a home is much more welcoming when there’s a green focal point close by. The quick fix is bold plants in the elegant container. Plant the Buxus in the centre and use as many of the seedlings as you can to create a thick carpet of dainty flowers around them. 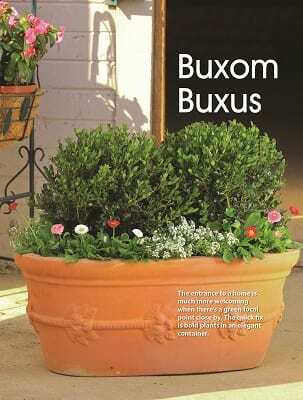 When we put together our monthly pot recipes we take as much care choosing the container as we do choosing the plants. To suit the shape of the two Buxus, which had been trained into circular forms, we used a fairly large and deep clay tub decorated with a plant-themed relief around the outside. 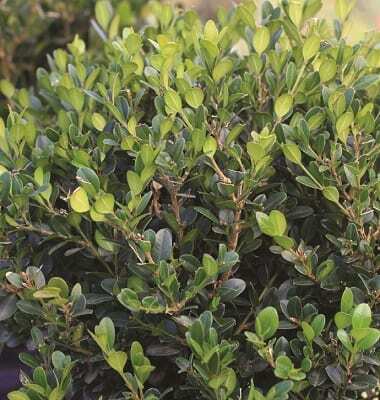 Common boxwood (BUXUS sempervirens) is used all over the cold northern hemisphere as a hedging plant because it tolerates heavy snow and icy weather. It was previously not a well-known or commonly used plant in South Africa. But, as formal gardening and the need for good plants to shape into topiary forms and low hedges became fashionable, plant growers started producing the faster growing BUXUS sempervirens ‘Faulkner’. ‘Faulkner’ grows into a compact, upright plant with dense foliage and a mature height and width of about 1 m x 90 cm. It is evergreen and very hardy and can be shaped into any form. It is a fantastic hedging plant too. For gardeners who enjoy ordered and very neat growth (without having to do too much maintenance), this plant has become a favourite for containers and low hedges. 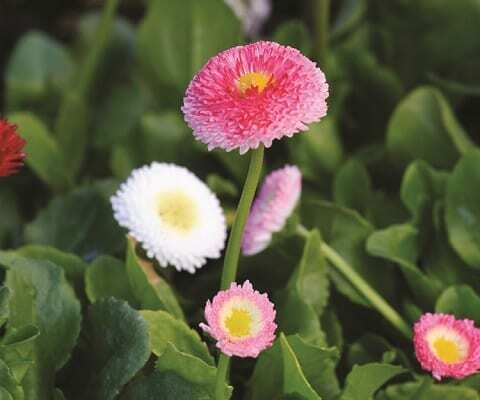 Lobularia ‘Snow Princess’PBR & TM Sweet alyssum – the unbeatable annual for masses of white, sweetscented flowers – has now met its match in a perennial cousin. 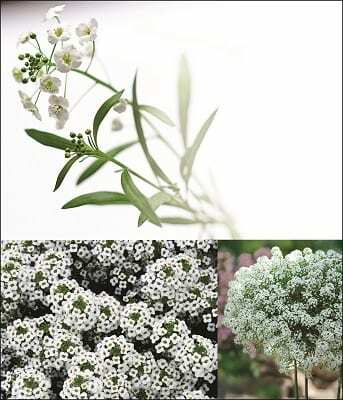 Snow PrincessPBR & TM has all the attributes that made sweet alyssum so popular, plus more. Not only is it a non-stop flowerer, it is perennial and will last for much longer. It will also grow much larger and spread further. To ensure this amazing plant flowers throughout the year give it generous applications of fertiliser and do some judicious pruning every three to four months.